Not to be confused with Madras or Madrassi. For the grape variety, see Madrasa (grape). For the 2013 film, see Madrasa (film). "Medrese" redirects here. For the place in Afghanistan, see Madraseh, Badakhshan. For the village in Azerbaijan, see Mədrəsə. "Madraza" redirects here. For the 2017 film, see Madraza (film). Madrasa (Arabic: مدرسة‎, madrasa, pl. مدارس, madāris) is the Arabic word for any type of educational institution, secular or religious (of any religion), whether for elementary instruction or higher learning. The word is variously transliterated madrasah, medresa, madrassa, madraza, medrese, etc. In the West, the word usually refers to a specific type of religious school or college for the study of the Islamic religion, though this may not be the only subject studied. 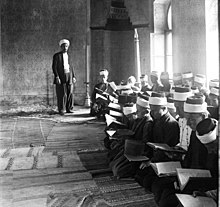 The word madrasah derives from the triconsonantal Semitic root د-ر-س D-R-S 'to learn, study', through the wazn (form/stem) مفعل(ة)‎; mafʻal(ah), meaning "a place where something is done". Therefore, madrasah literally means "a place where learning and studying take place". The word is also present as a loanword with the same innocuous meaning in many Arabic-influenced languages, such as: Urdu, Bengali, Pashto, Baluchi, Persian, Turkish, Azeri, Kurdish, Indonesian, Malay and Bosnian. In the Arabic language, the word مدرسة madrasah simply means the same as school does in the English language, whether that is private, public or parochial school, as well as for any primary or secondary school whether Muslim, non-Muslim, or secular. Unlike the use of the word school in British English, the word madrasah more closely resembles the term school in American English, in that it can refer to a university-level or post-graduate school as well as to a primary or secondary school. For example, in the Ottoman Empire during the Early Modern Period, madaris had lower schools and specialised schools where the students became known as danişmends. The usual Arabic word for a university, however, is جامعة (jāmiʻah). The Hebrew cognate midrasha also connotes the meaning of a place of learning; the related term midrash literally refers to study or learning, but has acquired mystical and religious connotations. However, in English, the term madrasah usually refers to the specifically Islamic institutions. A typical Islamic school usually offers two courses of study: a ḥifẓ course teaching memorization of the Qur'an (the person who commits the entire Qur'an to memory is called a ḥāfiẓ); and an ʻālim course leading the candidate to become an accepted scholar in the community. A regular curriculum includes courses in Arabic, tafsir (Qur'anic interpretation), sharīʻah (Islamic law), hadiths (recorded sayings and deeds of Muhammad), mantiq (logic), and Muslim history. In the Ottoman Empire, during the Early Modern Period, the study of hadiths was introduced by Süleyman I. Depending on the educational demands, some madaris also offer additional advanced courses in Arabic literature, English and other foreign languages, as well as science and world history. Ottoman madaris along with religious teachings also taught "styles of writing, grammary, syntax, poetry, composition, natural sciences, political sciences, and etiquette." People of all ages attend, and many often move on to becoming imams. The certificate of an ʻālim, for example, requires approximately twelve years of study. A good number of the ḥuffāẓ (plural of ḥāfiẓ) are the product of the madaris. The madaris also resemble colleges, where people take evening classes and reside in dormitories. An important function of the madaris is to admit orphans and poor children in order to provide them with education and training. Madaris may enroll female students; however, they study separately from the men. The term "Islamic education" means education in the light of Islam itself, which is rooted in the teachings of the Qur'an - the holy book of the Muslims. Islamic education and Muslim education are not the same. Because Islamic education has epistemological integration which is founded on Tawhid - Oneness or monotheism. The first institute of madrasa education was at the estate of Zaid bin Arkam near a hill called Safa, where Muhammad was the teacher and the students were some of his followers. After Hijrah (migration) the madrasa of "Suffa" was established in Madina on the east side of the Al-Masjid an-Nabawi mosque. Ubada ibn as-Samit was appointed there by Muhammad as teacher and among the students. In the curriculum of the madrasa, there were teachings of The Qur'an, The Hadith, fara'iz, tajweed, genealogy, treatises of first aid, etc. There were also trainings of horse-riding, art of war, handwriting and calligraphy, athletics and martial arts. The first part of madrasa based education is estimated from the first day of "nabuwwat" to the first portion of the Umayyad Caliphate. Established in 859, Jāmiʻat al-Qarawīyīn (located in al-Qarawīyīn Mosque) in the city of Fas, Morocco, is considered the oldest university in the world by some scholars, though the existence of universities in the medieval Muslim world is debated. It was founded by Fāṭimah al-Fihrī, the daughter of a wealthy merchant named Muḥammad al-Fihrī. This was later followed by the establishment of al-Azhar in 959 in Cairo, Egypt. During the late ʻAbbāsid period, the Seljuk vizier Niẓām al-Mulk created one of the first major official academic institutions known in history as the Madrasah Niẓāmīyah, based on the informal majālis (sessions of the shaykhs). Niẓām al-Mulk, who would later be murdered by the Assassins (Ḥashshāshīn), created a system of state madaris (in his time they were called the Niẓāmiyyahs, named after him) in various ʻAbbāsid cities at the end of the 11th century. Alauddin Khalji's Madrasa, Qutb complex, built in the early-14th century in Delhi, India. During the rule of the Fatimid and Mamluk dynasties and their successor states in the medieval Middle East, many of the ruling elite founded madaris through a religious endowment known as the waqf. Not only was the madrasa a potent symbol of status but it was an effective means of transmitting wealth and status to their descendants. Especially during the Mamluk period, when only former slaves could assume power, the sons of the ruling Mamlūk elite were unable to inherit. Guaranteed positions within the new madaris thus allowed them to maintain status. 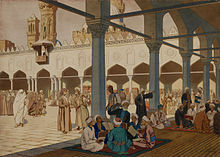 Madaris built in this period include the Mosque-Madrasah of Sultan Ḥasan in Cairo. Dimitri Gutas and the Stanford Encyclopedia of Philosophy consider the period between the 11th and 14th centuries to be the "Golden Age" of Arabic and Islamic philosophy, initiated by al-Ghazali's successful integration of logic into the madrasah curriculum and the subsequent rise of Avicennism. At the beginning of the Caliphate or Islamic Empire, the reliance on courts initially confined sponsorship and scholarly activities to major centres. Within several centuries, the development of Muslim educational institutions such as the madrasah and masjid eventually introduced such activities to provincial towns and dispersed them across the Islamic legal schools and Sufi orders. In addition to religious subjects, they also taught the "rational sciences," as varied as mathematics, astronomy, astrology, geography, alchemy, philosophy, magic, and occultism, depending on the curriculum of the specific institution in question. The madaris, however, were not centres of advanced scientific study; scientific advances in Islam were usually carried out by scholars working under the patronage of royal courts. During the Islamic Golden Age, the Caliphate experienced a growth in literacy, having the highest literacy rate of the Middle Ages, comparable to classical Athens' literacy in antiquity but on a much larger scale. The emergence of the maktab and madrasa institutions played a fundamental role in the relatively high literacy rates of the medieval Islamic world. Taşköprülüzâde's concept of knowledge and his division of the sciences provides a starting point for a study of learning and medrese education in the Ottoman Empire. Taşköprülüzâde recognises four stages of knowledge—spiritual, intellectual, oral and written. Thus all the sciences fall into one of these seven categories: calligraphic sciences, oral sciences, intellectual sciences, spiritual sciences, theoretical rational sciences, and practical rational sciences. The first Ottoman medrese was created in İznik in 1331, when a converted Church building was assigned as a medrese to a famous scholar, Dâvûd of Kayseri. Suleyman made an important change in the hierarchy of Ottoman medreses. He established four general medreses and two more for specialised studies, one devoted to the ḥadīth and the other to medicine. He gave the highest ranking to these and thus established the hierarchy of the medreses which was to continue until the end of the empire. In the medieval Islamic world, an elementary school was known as a maktab, which dates back to at least the 10th century. Like madaris (which referred to higher education), a maktab was often attached to an endowed mosque. In the 11th century, the famous Persian Islamic philosopher and teacher Ibn Sīnā (known as Avicenna in the West), in one of his books, wrote a chapter about the maktab entitled "The Role of the Teacher in the Training and Upbringing of Children," as a guide to teachers working at maktab schools. He wrote that children can learn better if taught in classes instead of individual tuition from private tutors, and he gave a number of reasons for why this is the case, citing the value of competition and emulation among pupils, as well as the usefulness of group discussions and debates. Ibn Sīnā described the curriculum of a maktab school in some detail, describing the curricula for two stages of education in a maktab school. Ibn Sīnā wrote that children should be sent to a maktab school from the age of 6 and be taught primary education until they reach the age of 14. During which time, he wrote, they should be taught the Qur'an, Islamic metaphysics, Arabic, literature, Islamic ethics, and manual skills (which could refer to a variety of practical skills). Ibn Sīnā refers to the secondary education stage of maktab schooling as a period of specialisation when pupils should begin to acquire manual skills, regardless of their social status. He writes that children after the age of 14 should be allowed to choose and specialise in subjects they have an interest in, whether it was reading, manual skills, literature, preaching, medicine, geometry, trade and commerce, craftsmanship, or any other subject or profession they would be interested in pursuing for a future career. He wrote that this was a transitional stage and that there needs to be flexibility regarding the age in which pupils graduate, as the student's emotional development and chosen subjects need to be taken into account. During its formative period, the term madrasah referred to a higher education institution, whose curriculum initially included only the "religious sciences", whilst philosophy and the secular sciences were often excluded. The curriculum slowly began to diversify, with many later madaris teaching both the religious and the "secular sciences", such as logic, mathematics and philosophy. Some madaris further extended their curriculum to history, politics, ethics, music, metaphysics, medicine, astronomy and chemistry. The curriculum of a madrasah was usually set by its founder, but most generally taught both the religious sciences and the physical sciences. Madaris were established throughout the Islamic world, examples being the 9th century University of al-Qarawiyyin, the 10th century al-Azhar University (the most famous), the 11th century Niẓāmīyah, as well as 75 madaris in Cairo, 51 in Damascus and up to 44 in Aleppo between 1155 and 1260. Many more were also established in the Andalusian cities of Córdoba, Seville, Toledo, Granada (Madrasah of Granada), Murcia, Almería, Valencia and Cádiz during the Caliphate of Córdoba. In the Ottoman Empire during the early modern period, "Madaris were divided into lower and specialised levels, which reveals that there was a sense of elevation in school. Students who studied in the specialised schools after completing courses in the lower levels became known as danişmends." 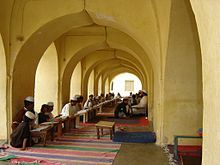 While "madrasah" can now refer to any type of school, the term madrasah was originally used to refer more specifically to a medieval Islamic centre of learning, mainly teaching Islamic law and theology, usually affiliated with a mosque, and funded by an early charitable trust known as waqf. Madaris were largely centred on the study of fiqh (Islamic jurisprudence). The ijāzat al-tadrīs wa-al-iftāʼ ("licence to teach and issue legal opinions") in the medieval Islamic legal education system had its origins in the 9th century after the formation of the madhāhib (schools of jurisprudence). George Makdisi considers the ijāzah to be the origin of the European doctorate. However, in an earlier article, he considered the ijāzah to be of "fundamental difference" to the medieval doctorate, since the former was awarded by an individual teacher-scholar not obliged to follow any formal criteria, whereas the latter was conferred on the student by the collective authority of the faculty. To obtain an ijāzah, a student "had to study in a guild school of law, usually four years for the basic undergraduate course" and ten or more years for a post-graduate course. The "doctorate was obtained after an oral examination to determine the originality of the candidate's theses", and to test the student's "ability to defend them against all objections, in disputations set up for the purpose." These were scholarly exercises practised throughout the student's "career as a graduate student of law." After students completed their post-graduate education, they were awarded ijazas giving them the status of faqīh 'scholar of jurisprudence', muftī 'scholar competent in issuing fatwās', and mudarris 'teacher'. The Arabic term ijāzat al-tadrīs was awarded to Islamic scholars who were qualified to teach. According to Makdisi, the Latin title licentia docendi 'licence to teach' in the European university may have been a translation of the Arabic, but the underlying concept was very different. A significant difference between the ijāzat al-tadrīs and the licentia docendi was that the former was awarded by the individual scholar-teacher, while the latter was awarded by the chief official of the university, who represented the collective faculty, rather than the individual scholar-teacher. Much of the study in the madrasah college centred on examining whether certain opinions of law were orthodox. This scholarly process of "determining orthodoxy began with a question which the Muslim layman, called in that capacity mustaftī, presented to a jurisconsult, called mufti, soliciting from him a response, called fatwa, a legal opinion (the religious law of Islam covers civil as well as religious matters). The mufti (professor of legal opinions) took this question, studied it, researched it intensively in the sacred scriptures, in order to find a solution to it. This process of scholarly research was called ijtihād, literally, the exertion of one's efforts to the utmost limit." Though Islamic medicine was most often taught at the bimaristan teaching hospitals, there were also several medical madaris dedicated to the teaching of medicine. For example, of the 155 madrasa colleges in 15th century Damascus, three of them were medical schools. Toby Huff argues that no medical degrees were granted to students, as there was no faculty that could issue them, and that, therefore, no system of examination and certification developed in the Islamic tradition like that of medieval Europe. However, the historians Andrew C. Miller, Nigel J. Shanks and Dawshe Al-Kalai point out that, during this era, physician licensure became mandatory in the Abbasid Caliphate. In 931 AD, Caliph Al-Muqtadir learned of the death of one of his subjects as a result of a physician's error. He immediately ordered his muhtasib Sinan ibn Thabit to examine and prevent doctors from practicing until they passed an examination. From this time on, licensing exams were required and only qualified physicians were allowed to practice medicine. In the Early Modern Period in the Ottoman Empire, "Suleyman I added new curriculums ['sic'] to the Ottoman medreses of which one was medicine, which alongside studying of the ḥadīth was given highest rank." Note: The word jāmiʻah (Arabic: جامعة‎) simply means 'university'. For more information, see Islamic university (disambiguation). Scholars like Arnold H. Green and Seyyed Hossein Nasr have argued that, starting in the 10th century, some medieval Islamic madaris indeed became universities. However, scholars like George Makdisi, Toby Huff and Norman Daniel argue that the European medieval university has no parallel in the medieval Islamic world. Darleen Pryds questions this view, pointing out that madaris and European universities in the Mediterranean region shared similar foundations by princely patrons and were intended to provide loyal administrators to further the rulers' agenda. A number of scholars regard the university as uniquely European in origin and characteristics. According to Encyclopædia Britannica, however, the earliest universities were founded in Asia and Africa, predating the first European medieval universities. Al-Qarawīyīn University in Fez, Morocco is recognised by many historians as the oldest degree-granting university in the world, having been founded in 859 by Fatima al-Fihri. While the madrasa college could also issue degrees at all levels, the jāmiʻahs (such as al-Qarawīyīn and al-Azhar University) differed in the sense that they were larger institutions, more universal in terms of their complete source of studies, had individual faculties for different subjects, and could house a number of mosques, madaris, and other institutions within them. Such an institution has thus been described as an "Islamic university". Al-Azhar University, founded in Cairo, Egypt in 975 by the Ismaʻīlī Shīʻī Fatimid dynasty as a jāmiʻah, had individual faculties for a theological seminary, Islamic law and jurisprudence, Arabic grammar, Islamic astronomy, early Islamic philosophy and logic in Islamic philosophy. The postgraduate doctorate in law was only obtained after "an oral examination to determine the originality of the candidate's theses", and to test the student's "ability to defend them against all objections, in disputations set up for the purpose." ‘Abd al-Laṭīf al-Baghdādī also delivered lectures on Islamic medicine at al-Azhar, while Maimonides delivered lectures on medicine and astronomy there during the time of Saladin. Another early jāmiʻah was the Niẓāmīyah of Baghdād (founded 1091), which has been called the "largest university of the Medieval world." Mustansiriya University, established by the ʻAbbāsid caliph al-Mustanṣir in 1233, in addition to teaching the religious subjects, offered courses dealing with philosophy, mathematics and the natural sciences. However, the classification of madaris as "universities" is disputed on the question of understanding of each institution on its own terms. In madaris, the ijāzahs were only issued in one field, the Islamic religious law of sharīʻah, and in no other field of learning. Other academic subjects, including the natural sciences, philosophy and literary studies, were only treated "ancillary" to the study of the Sharia. For example, a natural science like astronomy was only studied (if at all) to supply religious needs, like the time for prayer. This is why Ptolemaic astronomy was considered adequate, and is still taught in some modern day madaris. The Islamic law undergraduate degree from al-Azhar, the most prestigious madrasa, was traditionally granted without final examinations, but on the basis of the students' attentive attendance to courses. In contrast to the medieval doctorate which was granted by the collective authority of the faculty, the Islamic degree was not granted by the teacher to the pupil based on any formal criteria, but remained a "personal matter, the sole prerogative of the person bestowing it; no one could force him to give one". From a structural and legal point of view, the madrasa and the university were contrasting types. Whereas the madrasa was a pious endowment under the law of religious and charitable foundations (waqf), the universities of Europe were legally autonomous corporate entities that had many legal rights and privileges. These included the capacity to make their own internal rules and regulations, the right to buy and sell property, to have legal representation in various forums, to make contracts, to sue and be sued." Thus the university, as a form of social organization, was peculiar to medieval Europe. Later, it was exported to all parts of the world, including the Muslim East; and it has remained with us down to the present day. But back in the middle ages, outside of Europe, there was nothing anything quite like it anywhere. Nevertheless, Makdisi has asserted that the European university borrowed many of its features from the Islamic madrasa, including the concepts of a degree and doctorate. Makdisi and Hugh Goddard have also highlighted other terms and concepts now used in modern universities which most likely have Islamic origins, including "the fact that we still talk of professors holding the 'chairman' of their subject" being based on the "traditional Islamic pattern of teaching where the professor sits on a chair and the students sit around him", the term 'academic circles' being derived from the way in which Islamic students "sat in a circle around their professor", and terms such as "having 'fellows', 'reading' a subject, and obtaining 'degrees', can all be traced back" to the Islamic concepts of aṣḥāb ('companions, as of Muhammad'), qirāʼah ('reading aloud the Qur'an') and ijāzah ('licence [to teach]') respectively. Makdisi has listed eighteen such parallels in terminology which can be traced back to their roots in Islamic education. Some of the practices now common in modern universities which Makdisi and Goddard trace back to an Islamic root include "practices such as delivering inaugural lectures, wearing academic robes, obtaining doctorates by defending a thesis, and even the idea of academic freedom are also modelled on Islamic custom." The Islamic scholarly system of fatwá and ijmāʻ, meaning opinion and consensus respectively, formed the basis of the "scholarly system the West has practised in university scholarship from the Middle Ages down to the present day." According to Makdisi and Goddard, "the idea of academic freedom" in universities was also "modelled on Islamic custom" as practised in the medieval Madrasa system from the 9th century. Islamic influence was "certainly discernible in the foundation of the first deliberately planned university" in Europe, the University of Naples Federico II founded by Frederick II, Holy Roman Emperor in 1224. However, all of these facets of medieval university life are considered by standard scholarship to be independent medieval European developments with no tracable Islamic influence. Generally, some reviewers have pointed out the strong inclination of Makdisi of overstating his case by simply resting on "the accumulation of close parallels", but all the while failing to point to convincing channels of transmission between the Muslim and Christian world. Norman Daniel points out that the Arab equivalent of the Latin disputation, the taliqa, was reserved for the ruler's court, not the madrasa, and that the actual differences between Islamic fiqh and medieval European civil law were profound. The taliqa only reached Islamic Spain, the only likely point of transmission, after the establishment of the first medieval universities. In fact, there is no Latin translation of the taliqa and, most importantly, no evidence of Latin scholars ever showing awareness of Arab influence on the Latin method of disputation, something they would have certainly found noteworthy. Rather, it was the medieval reception of the Greek Organon which set the scholastic sic et non in motion. Daniel concludes that resemblances in method had more to with the two religions having "common problems: to reconcile the conflicting statements of their own authorities, and to safeguard the data of revelation from the impact of Greek philosophy"; thus Christian scholasticism and similar Arab concepts should be viewed in terms of a parallel occurrence, not of the transmission of ideas from one to the other, a view shared by Hugh Kennedy. It remains the case that no equivalent of the bachelor's degree, the licentia docendi, or higher degrees ever emerged in the medieval or early modern Islamic madrasas. As I noted in my original article, students in the medieval Islamic world, who had the full freedom to chose their teacher and the subjects that they would study together, could not have been worse off than today’s students, who are required to pursue a specific curriculum that is usually designed to promote the ideas of their elders and preserve tradition, rather than introduce them to innovative ideas that challenge ‘received texts.’ Moreover, if Professor Huff had looked more carefully at the European institutions that produced science, he would have found that they were mainly academies and royal courts protected by individual potentates and not the universities that he wishes to promote. But neither universities nor courts were beyond the reach of the Inquisition, which is another point that he seems to neglect. Prior to the 12th century, women accounted for less than one percent of the world’s Islamic scholars. However, al-Sakhawi and Mohammad Akram Nadwi have since found evidence of over 8,000 female scholars since the 15th century. al-Sakhawi devotes an entire volume of his 12-volume biographical dictionary al-Ḍawʾ al-lāmiʻ to female scholars, giving information on 1,075 of them. More recently, the scholar Mohammad Akram Nadwi, currently a researcher from the Oxford Centre for Islamic Studies, has written 40 volumes on the muḥaddithāt (the women scholars of hadith), and found at least 8,000 of them. From around 750, during the Abbasid Caliphate, women "became renowned for their brains as well as their beauty". In particular, many well known women of the time were trained from childhood in music, dancing and poetry. Mahbuba was one of these. Another feminine figure to be remembered for her achievements was Tawaddud, "a slave girl who was said to have been bought at great cost by Hārūn al-Rashīd because she had passed her examinations by the most eminent scholars in astronomy, medicine, law, philosophy, music, history, Arabic grammar, literature, theology and chess". Moreover, among the most prominent feminine figures was Shuhda who was known as "the Scholar" or "the Pride of Women" during the 12th century in Baghdad. Despite the recognition of women's aptitudes during the Abbasid dynasty, all these came to an end in Iraq with the sack of Baghdad in 1258. Women played an important role in the foundations of many Islamic educational institutions, such as Fatima al-Fihri's founding of the University of Al Karaouine in 859. This continued through to the Ayyubid dynasty in the 12th and 13th centuries, when 160 mosques and madaris were established in Damascus, 26 of which were funded by women through the Waqf (charitable trust) system. Half of all the royal patrons for these institutions were also women. How splendid were the women of the ansar; shame did not prevent them from becoming learned in the faith. [Consider] what some women do when people gather with a shaykh to hear [the recitation of] books. At that point women come, too, to hear the readings; the men sit in one place, the women facing them. It even happens at such times that some of the women are carried away by the situation; one will stand up, and sit down, and shout in a loud voice. [Moreover,] her awra will appear; in her house, their exposure would be forbidden — how can it be allowed in a mosque, in the presence of men? The term ʻawrah is often translated as 'that which is indecent', which usually meant the exposure of anything other than a woman's face and hands, although scholarly interpretations of the ʻawrah and ḥijāb have always tended to vary, with some more or less strict than others. "The first Ottoman Medrese was created in İznik in 1331 and most Ottoman medreses followed the traditions of Sunni Islam." "When an Ottoman sultan established a new medrese, he would invite scholars from the Islamic world—for example, Murad II brought scholars from Persia, such as ʻAlāʼ al-Dīn and Fakhr al-Dīn who helped enhance the reputation of the Ottoman medrese". This reveals that the Islamic world was interconnected in the early modern period as they travelled around to other Islamic states exchanging knowledge. This sense that the Ottoman Empire was becoming modernised through globalization is also recognised by Hamadeh who says: "Change in the eighteenth century as the beginning of a long and unilinear march toward westernisation reflects the two centuries of reformation in sovereign identity." İnalcık also mentions that while scholars from for example Persia travelled to the Ottomans in order to share their knowledge, Ottomans travelled as well to receive education from scholars of these Islamic lands, such as Egypt, Persia and Turkestan. Hence, this reveals that similar to today's modern world, individuals from the early modern society travelled abroad to receive education and share knowledge and that the world was more interconnected than it seems. Also, it reveals how the system of "schooling" was also similar to today's modern world where students travel abroad to different countries for studies. Examples of Ottoman madaris are the ones built by Mehmed the Conqueror. He built eight madaris that were built "on either side of the mosque where there were eight higher madaris for specialised studies and eight lower medreses, which prepared students for these." The fact that they were built around, or near mosques reveals the religious impulses behind madrasa building and it reveals the interconnectedness between institutions of learning and religion. The students who completed their education in the lower medreses became known as danismends. This reveals that similar to the education system today, the Ottomans' educational system involved different kinds of schools attached to different kinds of levels. For example, there were lower madaris and specialised ones, and for one to get into the specialised area meant that he had to complete the classes in the lower one in order to adequately prepare himself for higher learning. This is the rank of madaris in the Ottoman Empire from the highest ranking to the lowest: (From İnalcık, 167). Madaris built by earlier sultans in Bursa. Madaris endowed by great men of state. Although Ottoman madaris had a number of different branches of study, such as calligraphic sciences, oral sciences, and intellectual sciences, they primarily served the function of an Islamic centre for spiritual learning. "The goal of all knowledge and in particular, of the spiritual sciences is knowledge of God." Religion, for the most part, determines the significance and importance of each science. As İnalcık mentions: "Those which aid religion are good and sciences like astrology are bad." However, even though mathematics, or studies in logic were part of the madrasa's curriculum, they were all centred around religion. Even mathematics had a religious impulse behind its teachings. "The Ulema of the Ottoman medreses held the view that hostility to logic and mathematics was futile since these accustomed the mind to correct thinking and thus helped to reveal divine truths" – key word being "divine". İnalcık also mentions that even philosophy was only allowed to be studied so that it helped to confirm the doctrines of Islam." Hence, madaris – schools were basically religious centres for religious teachings and learning in the Ottoman world. Although scholars such as Goffman have argued that the Ottomans were highly tolerant and lived in a pluralistic society, it seems that schools that were the main centres for learning were in fact heftily religious and were not religiously pluralistic, but centred around Islam. Similarly, in Europe "Jewish children learned the Hebrew letters and texts of basic prayers at home, and then attended a school organised by the synagogue to study the Torah." Wiesner-Hanks also says that Protestants also wanted to teach "proper religious values." This shows that in the early modern period, Ottomans and Europeans were similar in their ideas about how schools should be managed and what they should be primarily focused on. Thus, Ottoman madaris were very similar to present day schools in the sense that they offered a wide range of studies; however, these studies, in their ultimate objective, aimed to further solidify and consolidate Islamic practices and theories. As is previously mentioned, religion dominated much of the knowledge and teachings that were endowed upon students. "Religious learning as the only true science, whose sole aim was the understanding of God's word." Thus, it is important to keep this impulse in mind when going over the curriculum that was taught. The following is taken from İnalcık. A) Calligraphic sciences—such as styles of writing. B) Oral sciences—such as Arabic language, grammar and syntax. C) Intellectual sciences—logic in Islamic philosophy. D) Spiritual sciences—theoretical, such as Islamic theology and mathematics; and practical, such as Islamic ethics and politics. As with any other country during the Early Modern Period, such as Italy and Spain in Europe, the Ottoman social life was interconnected with the medrese. Medreses were built in as part of a Mosque complex where many programmes, such as aid to the poor through soup kitchens, were held under the infrastructure of a mosque, which reveals the interconnectedness of religion and social life during this period. "The mosques to which medreses were attached, dominated the social life in Ottoman cities." Social life was not dominated by religion only in the Muslim world of the Ottoman Empire; it was also quite similar to the social life of Europe during this period. As Goffman says: "Just as mosques dominated social life for the Ottomans, churches and synagogues dominated life for the Christians and Jews as well." Hence, social life and the medrese were closely linked, since medreses taught many curricula, such as religion, which highly governed social life in terms of establishing orthodoxy. "They tried moving their developing state toward Islamic orthodoxy." Overall, the fact that mosques contained medreses comes to show the relevance of education to religion in the sense that education took place within the framework of religion and religion established social life by trying to create a common religious orthodoxy. Hence, medreses were simply part of the social life of society as students came to learn the fundamentals of their societal values and beliefs. There are three different madrasa education systems in Bangladesh: the original darse nizami system, the redesigned nizami system, and the higher syllabus alia nisab. The first two categories are commonly called Qawmi or non-government madaris. Amongst them the most notable are Al-Jamiatul Ahlia Darul Ulum Moinul Islam in Hathazari, Al-Jamiah Al-Islamiah Patiya, in Patiya, and Jamia Tawakkulia Renga Madrasah in Sylhet. In 2006 there were 15,000 registered Qawmi madaris with the Befaqul Mudarressin of Bangladesh Qawmi Madrasah Education Board, though the figure could be well over double that number if unregistered madaris were counted. Quvvathul Islam Senior Madrassa, Taliparamba, India. 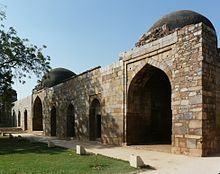 This is a madarasa of the Jamia Masjid mosque in Srirangapatna, India. This mosque dates back to the 1700s and is where Tipu Sultan used to pray. After the establishment of the British Raj and the emergence of Darul Ulum Manazar-e Islam Bareilly Sharif, Indian Muslim Scholars left India to establish madaris in other regions of the world. Some of the most notable of these madaris are Darul Ulum Holocombe, which produced scholars such as Shaikh Ibrahim Memon Madani, or Darul Uloom Al-Madania. These offshoot schools symbolise an emotional drive based upon both religion and patriotism that is not evident elsewhere. The Arabic and Islamic educational system has also become a channel for employment in the Middle East in modern times in Kerala. Originating in 8th century madaris for primary children, Arabic and Islamic schooling in Kerala was patronised and funded by the British colonial government. Today, the system of Arabic and Islamic education has grown and further integrated with Kerala government administration. 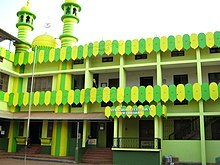 In 2005, an estimated 6,000 Muslim Arabic teachers taught in Kerala government schools, with over 500,000 Muslim students. State-appointed committees, not private mosques or religious scholars outside the government, determine the curriculum and accreditation of new schools and colleges. Primary education in Arabic and Islamic studies is available to Kerala Muslims almost entirely in after-school madrasa programs - sharply unlike the full-time madaris common in north India, which may replace formal schooling. Arabic colleges (over eleven of which exist within the state-run University of Calicut and the Kannur University) provide B.A. and Masters' level degrees. At all levels, instruction is co-educational, with many women instructors and professors. Islamic education boards are independently run by the following organizations, accredited by the Kerala state government: Samastha Kerala Islamic Education Board, Kerala Nadvathul Mujahideen, Jamaat-e-Islami Hind, and Jamiat Ulema-e-Hind. With Malayalam rather than Urdu as the lingua franca of Kerala Muslims, these madaris and colleges are relatively unknown and unlinked from Urdu-based madaris in the rest of India, due to the linguistic barrier. Madrasa e Faizan e Madina in Karachi, Pakistan. The madaris rose as colleges of learning in the Islamic world in the 11th century, though there were institutions of learning earlier. They catered not only to the religious establishment, though that was the dominant influence over them, but also the secular one. To the latter they supplied physicians, administrative officials, judges and teachers. Today many Registered madaris are working effectively and coping up with modern education system such as Jamia-tul-Madina which is a chain of Islamic schools in Pakistan and in European and other countries established by Dawat-e-Islami. 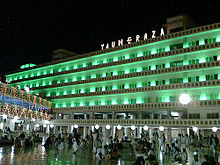 The Jamia-tul-Madina are also known as Faizan-e-Madina. Dawat-e-Islami has grown its network of Madaris from Pakistan to Europe. In Southeast Asia, Muslim students have a choice of attending a secular government or an Islamic school. Madaris or Islamic schools are known as Sekolah Agama (Malay: religious school) in Malaysia and Indonesia, โรงเรียนศาสนาอิสลาม (Thai: school of Islam) in Thailand and madaris in the Philippines. In countries where Islam is not the majority or state religion, Islamic schools are found in regions such as southern Thailand (near the Thai-Malaysian border) and the southern Philippines in Mindanao, where a significant Muslim population can be found. In Singapore, madrasahs are private schools which are overseen by Majlis Ugama Islam Singapura (MUIS, Islamic Religious Council of Singapore). There are six Madrasahs in Singapore, catering to students from Primary 1 to Secondary 4 (and junior college equivalent, or "Pre-U", at several schools). Four Madrasahs are coeducational and two are for girls. Students take a range of Islamic Studies subjects in addition to mainstream MOE curriculum subjects and sit for the PSLE and GCE 'O' Levels like their peers. In 2009, MUIS introduced the "Joint Madrasah System" (JMS), a joint collaboration of Madrasah Al-Irsyad Al-Islamiah primary school and secondary schools Madrasah Aljunied Al-Islamiah (offering the ukhrawi, or religious stream) and Madrasah Al-Arabiah Al-Islamiah (offering the academic stream). The JMS aims to introduce the International Baccalaureate (IB) programme into the Madrasah Al-Arabiah Al-Islamiah by 2019. Students attending a madrasah are required to wear the traditional Malay attire, including the songkok for boys and tudong for girls, in contrast to mainstream government schools which ban religious headgear as Singapore is officially a secular state. Students who wish to attend a mainstream school may opt to take classes on weekends at the madrasah instead of enrolling full-time. In 2004, madaris were mainstreamed in 16 Regions nationwide, primarily in Muslim-majority areas in Mindanao under the auspices of the Department of Education (DepEd). The DepEd adopted Department Order No. 51, which instituted Arabic-language and Islamic Values instruction for Muslim children in state schools, and authorised implementation of the Standard Madrasa Curriculum (SMC) in private-run madaris. While there are state-recognised Islamic schools, such as Ibn Siena Integrated School in the Islamic City of Marawi, Sarang Bangun LC in Zamboanga and SMIE in Jolo, their Islamic studies programmes initially varied in application and content. Since 2005, the AusAID-funded DepEd project Basic Education Assistance for Mindanao (BEAM) has assisted a group of private madaris seeking a Permit To Operate from the government and implement the SMC. These private madaris are scattered throughout Regions XI, XII and the Autonomous Region in Muslim Mindanao. In South Africa, the madaris also play a social and cultural role in giving after-school religious instruction to children of Muslims who attend government or private non-religious schools. However, increasing numbers of more affluent Muslims' children attend fully-fledged private Islamic schools, which combine secular and religious education. Among Muslims of Indian origin, madaris also used to provide instruction in Urdu, although this is far less common today than it used to be. The first Madressa established in North America, Al-Rashid Islamic Institute, was established in Cornwall, Ontario in 1983 and has graduates who are Hafiz (Quran) and Ulama. The seminary was established by Mazhar Alam under the direction of his teacher the leading Indian Tablighi scholar Muhammad Zakariya Kandhlawi and focuses on the Hanafi school of thought . Due to its proximity to the US border city of Messina the school has historically had a high ratio of US students. Their most prominent graduate Shaykh Muhammad Alshareef completed his Hifz in the early 1990s then went on to form the AlMaghrib Institute. On May 26, 2012, Congressman André Carson of Indiana called for additional Madaris in the United States. There is a madrassa in Queens, NY called Shia Ithna-Asheri Jamaat of New York. à It would be Presently, the Darul Uloom in New York City, an affiliate of Darul Uloom Haqqania in Pakistan, also serves as a madrassa. Western commentators post-9/11 often perceive madaris as places of radical revivalism with a connotation of anti-Americanism and radical extremism, frequently associated in the Western press with Wahhabi attitudes toward non-Muslims. In Arabic the word madrasa simply means "school" and does not imply a political or religious affiliation, radical or otherwise. Madaris have varied curricula, and are not all religious. Some madaris in India, for example, have a secularised identity. Although early madaris were founded primarily to gain "knowledge of God" they also taught subjects such as mathematics and poetry. For example, in the Ottoman Empire, "Madrasahs had seven categories of sciences that were taught, such as: styles of writing, oral sciences like the Arabic language, grammar, rhetoric, and history and intellectual sciences, such as logic." This is similar to the Western world, in which universities began as institutions of the Catholic church. When articles mentioned "madrassas," readers were led to infer that all schools so-named are anti-American, anti-Western, pro-terrorist centres having less to do with teaching basic literacy and more to do with political indoctrination. An article [...] about a pointed exchange [...] over a Web site report that said Senator Barack Obama had attended an Islamic school or madrassa in Indonesia as a child referred imprecisely to madrassas. While some [madrassas] teach a radical version of Islam, most historically have not. ^ "Madarasaa". WordAnywhere. Archived from the original on 2007-09-27. Retrieved 2007-06-23. ^ "Alternate Spellings of Madrassa". ThoughtCo. Retrieved 2017-05-30. ^ Madrasah ʻāmmah (Arabic: مدرسة عامة‎) translates as 'public school', madrasah khāṣṣah (Arabic: مدرسة خاصة‎) translates as 'private school', madrasah dīnīyah (Arabic: مدرسة دينية‎) translates as 'religious school', madrasah Islāmīyah (Arabic: مدرسة إسلامية‎) translates as 'Islamic school', and madrasah jāmiʻah (Arabic: مدرسة جامعة‎) translates as 'university'. ^ a b c d e f g h i j k l m n o p q r s t İnalcık, Halil. 1973. "Learning, the Medrese, and the Ulema." In The Ottoman Empire: The Classical Age 1300–1600. New York: Praeger, pp. 165–178. ^ Blanchard, Christopher M. (2008). "Islamic religious schools, Madrasas: Background" (PDF). Archived from the original (PDF) on 2005-03-05. ^ Baba, S., Salleh, M. J., Zayed, T. M., & Harris, R. (2015). A Qur’anic Methodology for Integrating Knowledge and Education: Implications for Malaysia’s Islamic Education Strategy. The American Journal of Islamic Social Sciences, 32(2). ^ Baba, S., & Zayed, T. M. (2015). Knowledge of Shariah and Knowledge to Manage “Self” and “System”: Integration of Islamic Epistemology with the Knowledge and Education. Journal of Islam, Law and Judiciary, 1(1), 45–62. ^ while other scholars have argued that this distinction belongs to the University of Al-Karaouine, also founded in 859. Esposito, John (2003). The Oxford Dictionary of Islam. Oxford University Press. p. 328. ISBN 0-19-512559-2. Kettani, M. Ali. Engineering Education in the Arab World. Middle East Journal, 1974, 28(4):441. ^ Tony Street (July 23, 2008). "Arabic and Islamic Philosophy of Language and Logic". Stanford Encyclopedia of Philosophy. Retrieved 2008-12-05. ^ Alatas, Syed Farid (2006), "From Jami`ah to University: Multiculturalism and Christian–Muslim Dialogue", Current Sociology, 54 (1): 112–132 , doi:10.1177/0011392106058837, The main subjects taught were Quranic exegesis, theology, jurisprudence and the principles of jurisprudence, grammar and syntax, the Traditions of Muhammad(ḥadīth), logic and, sometimes, philosophy and mathematics. In addition to the above, other subjects such as literary studies, history, politics, ethics, music, metaphysics, medicine, astronomy and chemistry were also taught. ^ Toby Huff, Rise of Early Modern Science 2nd. ed. p. 78-79; 136, 155. ^ a b c Miller, Andrew C (December 2006). "Jundi-Shapur, bimaristans, and the rise of academic medical centres". Journal of the Royal Society of Medicine. 99 (12). pp. 615–617. doi:10.1258/jrsm.99.12.615. Archived from the original on 2013-02-01. ^ a b c d Nigel J. Shanks, Dawshe Al-Kalai (January 1984). "Arabian medicine in the Middle Ages". Journal of the Royal Society of Medicine. 77 (1): 60–65. PMC 1439563. PMID 6366229. ^ Daniel, Norman (1984). "Review of "The Rise of Colleges. Institutions of Learning in Islam and the West by George Makdisi"". Journal of the American Oriental Society. 104 (3): 586–8. doi:10.2307/601679. JSTOR 601679. The first section, typology of institutions and the law of waqf, is crucial to the main thesis, since the college is defined in terms of the charitable trust, or endowment, as in Europe: it is admitted that the university, defined as a corporation, has no Islamic parallel. Thus the university, as a form of social organisation, was peculiar to medieval Europe. Later, it was exported to all parts of the world, including the Muslim East; and it has remained with us down to the present day. But back in the middle ages, outside of Europe, there was nothing anything quite like it anywhere. ^ Nuria Sanz, Sjur Bergan. The heritage of European universities, Volume 548. Council of Europe. p. 121. ^ Esposito, John (2003). The Oxford Dictionary of Islam. Oxford University Press. p. 328. ISBN 0-19-512559-2. ^ Kettani, M. Ali. Engineering Education in the Arab World. Middle East Journal, 1974, 28(4):441. ^ Alatas, Syed Farid (2006), "From Jamiʻah to University: Multiculturalism and Christian–Muslim Dialogue", Current Sociology, 54 (1): 112–132 , doi:10.1177/0011392106058837, One such jamiʻ was that of al-Azhar in Cairo. This was established during the last quarter of the 10th century by the Fatimids to teach the principles of jurisprudence, grammar, philosophy, logic and astronomy. [...] It is here that we may find the origins of the modern universitas. ^ "Metapress - Discover More". 24 June 2016. There was no other doctorate in any other field, no license to teach a field, except that of the religious law. To obtain a doctorate, one had to study in a guild school of law. Madrasa,...in mediaeval usage, essentially a college of law in which the other Islamic sciences, including literary and philosophical ones, were ancillary subjects only. There was no examination at the end of the course of study. Many of the students were well advanced in years. Those who left al-Azhar obtained an idjāza or licence to teach; this was a certificate given by the teacher under whom the student had followed courses, testifying to the student's diligence and proficiency. Perhaps the most fundamental difference between the two systems is embodied in their systems of certification; namely, in medieval Europe, the licentia docendi, or license to teach; in medieval Islam, the ijāzah, or authorization. In Europe, the license to teach was a license to teach a certain field of knowledge. It was conferred by the licensed masters acting as a corporation, with the consent of a Church authority, in Paris, by the Chancellor of the Cathedral Chapter... Certification in the Muslim East remained a personal matter between the master and the student. The master conferred it on an individual for a particular work, or works. Qualification, in the strict sense of the word, was supposed to be a criterion, but it was at the full discretion of the master, since, if he chose, he could give an ijaza to children hardly able to read, or even to unborn children. This was surely an abuse of the system... but no official system was involved. The ijaza was a personal matter, the sole prerogative of the person bestowing it; no one could force him to give one. ^ Toby Huff, Rise of early modern science 2nd ed. (Cambridge University, 2003) p. 149. It is more likely that the undeniable similarities sprang from similar circumstances. Both cultural traditions had sacred writings which needed to be examined, both had systems of law that looked back to ancient precedent, neither culture knew printing (which meant that dictation and verbal communication were so important). ^ Nadwi, Mohammad Akram (2013). al-Muhaddithat. Oxford: Interface Publications. ^ "A Secret History". The New York Times. 25 February 2007. ^ ibn al-Hajjaj, Muslim. Sahih Muslim. Retrieved 11 November 2017. ^ Hamadeh, Shirine (2004). "Ottoman Expressions of Early Modernity and the 'Inevitable' Question of Westernization". The Journal of Architectural Historians. 63 (1): 32–51. doi:10.2307/4127991. ^ a b Wiesner-Hanks, E. Merry. Early Modern Europe 1450–1789. New York: U of Cambridge P, 2006. ^ a b c Goffman, Daniel. The Ottoman Empire and Early Modern Europe. United Kingdom: U of Cambridge P, 2002. ^ Siddiqi, ABM Saiful Islam (2012). "Madrasah". In Islam, Sirajul; Jamal, Ahmed A. (eds.). Banglapedia: National Encyclopedia of Bangladesh (Second ed.). Asiatic Society of Bangladesh. ^ "Qawmi madrasas under watch". The Daily Star. 2009-03-31. Archived from the original on 2012-10-23. ^ Ahmed, Samina. Testimony of Samina Ahmed to U.S. Senate Foreign Relations Committee Archived 2011-03-03 at the Wayback Machine. 19 Apr 2005. ^ "Indian state de-recognises madrasa education". ^ Rashid, Alok Deshpande, Omar. "In Maharashtra, students obtaining full-time religious education to be considered uneducated". ^ "Contrasting views of madrasahs in multi-ethnic Singapore". AsiaOne. 19 February 2009. ^ "Background of Madrasahs". muis.gov.sg. 1994. ^ "Muslim Congressman: American Schools Should Be Modeled After Madrassas, 'Where The Foundation Is The Koran'". Fox News Channel. July 5, 2012. ^ Nahar, Sunita (2006-03-31). "What role for madrassas that teach Hindus?". BBC News. Retrieved 2010-05-12. ^ a b Moeller, Susan (2007-06-21). "Jumping on the US Bandwagon for a "War on Terror"". YaleGlobal Online. Yale Center for the Study of Globalization. Archived from the original on 2009-05-05. ^ Rumsfeld, Donald (2003-10-16). "Rumsfeld's war-on-terror memo" (Transcript). USA Today. Retrieved 2008-01-14. ^ "Madrassas breeding grounds of terrorists: Powell". The Tribune. 2004-03-11. Retrieved 2008-01-14. ^ Bill Carter (2007-01-27) [revised version]. "Rivals CNN and Fox News Spar Over Obama Report". The New York Times. Retrieved 2014-09-13. Esplanada, Jerry E. (2009-07-20). "Mainstreaming Madrasa. The Philippine Daily Inquirer." Retrieved 2010-11-25. Evans, Alexander. "Understanding Madrasahs", Foreign Affairs, Jan/Feb 2006. Malik, Jamal (ed.). Madrasas in South Asia: Teaching Terror?. London and New York: Routledge, 2008. Malik, Jamal. Colonialization of Islam: Dissolution of Traditional Institutions in Pakistan. New Delhi: Manohar Publications, and Lahore: Vanguard Ltd., 1996. Rahman, Tariq. Denizens of Alien Worlds: A Study of Education, Inequality and Polarization in Pakistan. Karachi: Oxford University Press, 2004. Reprinted 2006. ISBN 978-0-19-597863-6. Chapter on "Madrassas". Tanweer, Bilal. "Revisiting the Madrasa Question". The News International, 6 May 2007. About a talk given by Dr. Nomanul Haq (University of Pennsylvania) at the Lahore University of Management Sciences (LUMS), Pakistan. Ziad, Waleed. "Madaris in Perspective" at the Wayback Machine (archived October 27, 2009). Reprinted from The News, March 21, 2004. Look up madrasa in Wiktionary, the free dictionary. This page was last edited on 7 April 2019, at 06:05 (UTC).